Samuel Alcott died in Toronto, Ontario, Canada, on March 24, 1926, and was buried in Park Lawn Cemetery there. He was a Sergeant in Company A who was on detached service at the Powder River Depot at the time of the Battle of the Little Bighorn. Thomas Murphy died on March 25, 1909, in Washington, D.C., and was buried in the Soldiers’ Home National Cemetery there. He was a Private in Company K who participated in the hilltop fight. Ferdinand A. Culbertson was born on March 26, 1845, in Pittsburgh, Pennsylvania. He was a Sergeant in Company A who participated in the valley and hilltop fights. Aaron Lee Woods died in Philadelphia, Pennsylvania, on March 26, 1902, and was buried there in Mount Moriah Cemetery. He was a Private in Company B who was with the pack train and participated in the hilltop fight. Frederick Holmstead died on March 27, 1880, at Fort Abraham Lincoln, Dakota Territory, and was buried in the Custer National Cemetery in Crow Agency, Montana. He was a Private in Company A who participated in the valley and hilltop fights during which he was wounded. Thomas Henry French (left) died on March 27, 1882, at Planters House, in Fort Leavenworth, Kansas, and was originally buried in the National Cemetery there. He was exhumed on March 4, 1891, and reinterred in Holy Rood Cemetery in Washington, D.C.
George Anderson married Louisa Kiesel on March 27, 1911, in Minneapolis, Minnesota. He was a Private in Company K who was not present at the battle due to detached service. William Carson Williams was born on March 28, 1856, in Wheeling, West Virginia. He was a Private in Company H who was wounded during the hilltop fight. Harvey Alexander Fox died in Warm Springs, Montana, on March 28, 1913, and was buried next to Scout William Jackson in St. Michael’s Cemetery in Browning, Montana. He was a Private in Company D who was not present at the battle due to detached service. Marcus Albert Reno (left) died on March 30, 1889, in Washington, D.C. He was originally buried there in Greenwood Cemetery but was later reinterred at Custer National Cemetery in Montana. He was a Major at the time of the battle in command of a battalion during the valley and hilltop fights. William Henry Davenport died in Flushing, New York, on March 30, 1934. He was a Private in Company B who was with the pack train and participated in the hilltop fight. Lawrence Murphy died on January 13, 1888, at the Soldiers’ Home in Washington, D.C., and was buried in its National Cemetery. He was a Sergeant with Company E, but he was on detached service during the Battle of the Little Bighorn. William Martin died in Knoxville, Tennessee, on January 13, 1900, and was buried there. He was a Private with Company B who participated in the hilltop fight. James Madison DeWolf (left) was born in Mehonpany, Pennsylvania, on January 14, 1843. He was the Acting Assistant Surgeon for the Seventh, and he was killed during the battle. Thomas F. O’Neill was born on January 14, 1846, in Dublin, Ireland. He was a Private with Company G who participated in the valley and hilltop fights. Andrew Fredericks died on January 14, 1881, at Fort Totten, Dakota Territory, and was buried in the Custer National Cemetery on Crow Agency, Montana. He was a sergeant in Company K who participated in the hilltop fight. Charles Braden (right) died on January 15, 1919, in Highland Falls, New York, and was buried at the U.S. Military Academy Post Cemetery. He was not present at the battle due to wounds suffered during an Indian attack on his camp on the Yellowstone River on August 11, 1873. He was granted a leave of absence on March 13, 1874, until he retired due to disability on June 28, 1878. Young Hawk died on January 16, 1915, in Elbowoods, North Dakota, and was buried in the Indian Scout Cemetery in McLean County, North Dakota. He was a Scout who participated in the valley and hilltop fights. John Rafter died on January 16, 1927, in Leavenworth, Kansas, and was buried in the Mount Calvary Cemetery there. He was the Sergeant for Company K who was with the pack train and participated in the hilltop fight. Fremont Kipp (left) died in Washington, D.C., on January 16, 1938, and was buried there in the Soldiers’ Home National Cemetery. He was a Private in Company D who participated in the hilltop fight. Francis Hegner died in Kenockee Township, Michigan, on January 17, 1891. He was a Private in Company F on detached service during the battle, so he was not present. Francis Marion Gibson (right) died on January 17, 1919, in New York City and was buried at Arlington National Cemetery. He was a First Lieutenant in Company H who performed scouting duty and participated in the hilltop fight. He was the brother-in-law of Donald McIntosh. Joseph Carroll was born in New York, New York, on January 19, 1847. He was a member of the band, so he was not present at the battle. John E. Hammon (left) died on January 19, 1909, in Sturgis, South Dakota, and was buried there in the Bear Butte Cemetery. He was a Corporal in Company G and was in the hilltop and valley fights. Joseph Bates, who was also known as John or Joseph Murphy, was born in Providence, Rhode Island, on June 10, 1838. He was a Private with Company M who participated in the valley and hilltop fights at the Battle of the Little Bighorn. Elmer Babcock was born on June 10, 1856, in Pharsalia, Chenango County, New York. He was a Private in Company L who was killed with Custer’s Column. Samuel Davis Sturgis (left) was born in Shippensburg, Pennsylvania, on June 11, 1822. Colonel Sturgis was an 1846 graduate of the United States Military Academy at West Point who was Commanding the 7th Regiment of Cavalry at the time of the battle but was on detached service in St. Louis, Missouri, at the time. Unfortunately, his son, Second Lieutenant James Garland Sturgis was with Company E during the battle and was killed. Edward D. Pigford was born on June 11, 1856, in West Elizabeth, Pennsylvania. He was a Private in Company M who was wounded during the valley and hilltop fights. William Heyn (right) died in Washington, D.C., on June 11, 1910, and was buried in the Soldiers’ Home National Cemetery there. He was a First Sergeant in Company A who was wounded in his left knee during the valley and hilltop fights. Peter Eixenberger was born on June 12, 1860, in Munich, Germany. He was a Private with the Band; therefore, he was not present at the battle. Peter Gannon died at Fort Assinniboine, Montana Territory, on June 12, 1886. He was first buried in a cemetery there and later reinterred in the Custer National Cemetery on the Crow Agency, Montana. He was a Sergeant in Company B who was not present at the battle due to detached service. Michael Murphy died on June 12, 1904, at the Soldiers’ Home in Washington, D.C., and was buried in the National Cemetery there. He was a Private in Company K who participated in the hilltop fight. John H. Day died in Monroe, Ouachita Parish, Louisiana, on June 13, 1894, and was buried in the Old City Cemetery there. He was a Private in Company H who participated in the hilltop fight. George Anderson was born on June 14, 1841, in St. Catherines, Canada. He was a Private in Company K who was not present at the battle due to detached service. John Samuel Ragsdale married Verna Bell Owen on June 14, 1926, but they divorced after 1940. He was a Private in Company A who was not present at the battle due to detached service. Christopher Pendle (left) was born on June 15, 1849, in Bavaria, Germany, and died on June 4, 1923, in Gardenville, Washington. His remains were cremated, and it is not known where they were dispersed. He was a Private in Company E who was not present at the battle due to detached service. James O’Neill was born in Liverpool, England, on June 15, 1851. He was a Private in Company B who was not present at the battle due to detached service. Charles Windolph, who was also known as Charles Wrangel, married Mary Jones on June 15, 1882. He was a Private in Company H who was wounded in the hilltop fight. He was awarded both the Medal of Honor and the Purple Heart for his service during the battle. Frederick William Benteen (left) married Catherine Louise Norman on January 7, 1862. He was Captain of Company H and commanded a battalion during the Battle of the Little Bighorn. He performed scouting duty and participated in the hilltop fight, during which he was wounded. George Blunt was born on January 9, 1846, in Baltimore, Maryland. He was a Private in Company K who participated in the hilltop fight. Francis Johnson Kennedy died on January 9, 1924, in St. Paul, Minnesota. His obituary claimed he was prevented from participating in the battle because of a snake bite. That contradicts all other accounts that have him in sick quarters prior to the battle, with the pack train in June, and fighting on Reno Hill during the battle. At some point, Kennedy apparently said he led Capt. Keogh’s horse Comanche. If his obituary is to be believed, he was perhaps the only “Reverse Sole Survivor;” i.e., someone who was at the battle but claimed not to have been. John W. Burkman (left) was born in Allegheny County, Pennsylvania, on January 10, 1839. He was a Private with Company L who was with the pack train and participated in the hilltop fight. John Dolan (right) married Lena C. Eagan on January 10, 1876. His second marriage to Josephine Fisher was in 1900. He was a Private in Company M who was on detached service during the battle. Ferdinand A. Culbertson died on January 10, 1889, in Detroit, Michigan, and was buried in the Woodmere Cemetery there. He was a Sergeant in Company A who participated in the valley and hilltop fights. Timothy Sullivan died on January 10, 1903, in Washington, D.C., and was buried in the Soldiers’ Home National Cemetery there. He was a Private with Company L who was with the pack train and in the hilltop fight. Benjamin Franklin Burdick died on January 11, 1930, in Albany, New York, and was buried in the Beverwyck Cemetery in Rensselaer, New York. He was a Private in Company A who was not present at the battle due to detached service. Bernard Lyons died on January 12, 1901, in Chicago, Illinois, and was buried in Calvary Cemetery in Evanston, Cook County, Illinois. He was a Private with Company F who was in the hilltop fight. 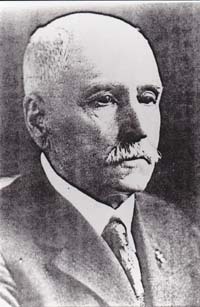 John H. Jordan died in Hartford, Connecticut, on January 12, 1906, and was buried in Old North Cemetery there. He was a Private with Company C who was with the pack train and participated in the hilltop fight. Lawrence Murphy died on January 13, 1888, at the Soldiers’ Home in Washington, D.C. He was a Sergeant with Company E, but he was on detached service during the battle. William Heyn died in Washington, D.C., on June 11, 1910, and was buried in the U.S. Soldiers’ Home National Cemetery there. He was a First Sergeant in Company A who was wounded during the valley and hilltop fights. Christopher Pendle (left) was born on June 15, 1849, in Bavaria, Germany, and died on June 4, 1923, in Gardenville, Washington. He was a Private in Company E who was not present at the battle due to detached service. Charles A. Windolph (left), who was also known as Charles Wrangel, married Mary Jones on June 15, 1882. He was a Private in Company H who was wounded in the hilltop fight. He was awarded both the Medal of Honor and the Purple Heart for his service during the battle. George B. Herendeen died in Havre, Montana, on June 17, 1919, and was buried in the Harlem Cemetery in Harlem, Montana. He was a Scout who participated in the valley and hilltop fights. Francis Johnson Kennedy (below, circa 1920) died on January 9, 1924, in St. Paul, Minnesota. His obituary claimed he was “prohibited from participating in General Custer’s famous and ill-fated expedition because of a snake-bite.” That contradicts all other accounts that have him in sick quarters prior to the battle, with the pack train in June, and fighting on Reno Hill during the battle. At some point, Kennedy apparently said he led Capt. Keogh’s horse Comanche. If his obituary is to be believed, he was perhaps the only “Reverse Sole Survivor;” i.e., someone who was at the battle but claimed not to have been. John W. Burkman was born in Allegheny County, Pennsylvania, on January 10, 1839. “Old Nutriment” cared for the Custer horses. John Dolan married Lena C. Eagan on January 10, 1876. His second marriage to Josephine Fisher was in 1900. He was on detached service during the battle. Timothy Sullivan died on January 10, 1903. He was a Private with Company L who was with the pack train and in the hilltop fight. George Blunt was born on January 11, 1845, in Baltimore, Maryland. He died of gas asphyxiation at the Joyce Hotel in Baltimore on November 23, 1905. Benjamin Franklin Burdick died on January 11, 1930, in Albany, New York, and was buried in the Beverwyck Cemetery in Rensselaer, New York. Bernard Lyons died on January 12, 1901. He was a Private with Company F who was in the hilltop fight. John Jordan died in Hartford, Connecticut, on January 12, 1906. He was a Private with Company C who participated in the hilltop fight. James Madison DeWolf was born in Mehonpany, Pennsylvania, on January 14, 1843. He was the Acting Assistant Surgeon for the Seventh, and he was killed during the battle. Andrew Fredericks died on January 14, 1881, at Fort Totten, Dakota Territory. He was buried in the Custer National Cemetery on Crow Agency, Montana.